The Dashboard is the main controlling form and is displayed when the workbook is opened. Subsequent forms are displayed using the buttons on the Dashboard. For example: Import bank statement, Create/amend transaction, Bank reconciliation, User configuration, Administration routines etc. Certain buttons may be disabled depending on the status of a bank transaction. Also the button description may change in particular circumstances. Download latest bank statement and move to the 'New Statements' Folder. Import bank statement via 'Import Statement' button. It is assumed that any customer invoices (SIN) and supplier invoices (PIN) have already been created in VT. Create bank receipt (REC) or bank payment (PAY) transactions using 'Create Transaction' button within the Bank Assistant or using the VT application. These default transaction types can be amended to use any of the Built-in and customised types. Note: receipt and payment transactions for multiple accounts must be created using the VT application. Transactions for single/multiple invoices for the same account can be processed using the Bank Assistant. Refresh the Bank statement using the 'Refresh' button. Resolve any exceptions and unallocated invoices & refresh again. 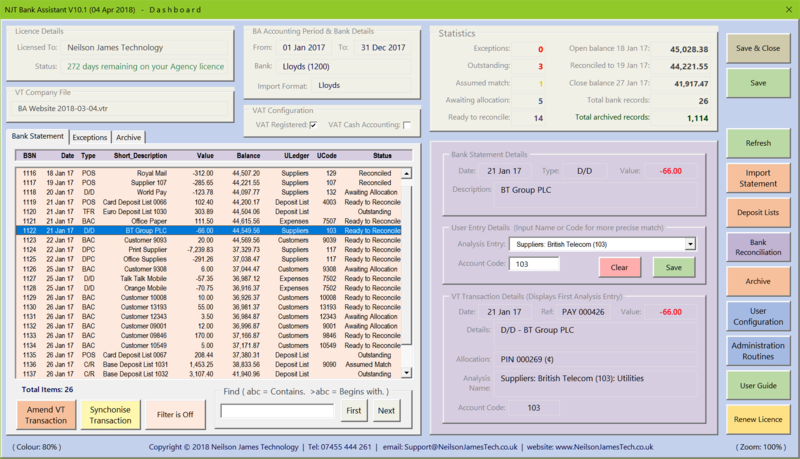 Run the bank reconciliation using the 'Bank Reconciliation' button. Note: the bank statement will be refreshed automatically. Click on the 'Accept' button to complete the bank reconciliation.